We arrived in Phnom Penh on Saturday. We supposed to see the city life on weekend and enjoyed it. But it ended up nobody was in Phnom Penh and all restaurants and shops closed since that was the 3rd day of Khmer New Year. US dollar is accepted everywhere. However, do keep some small dollar (1, 2 or 5) for more convenient, such as tuk tuk to the hotel, snacks, drinks, toilet, etc. 1 USD = 4000 riels. The exchange rate is the same everywhere. 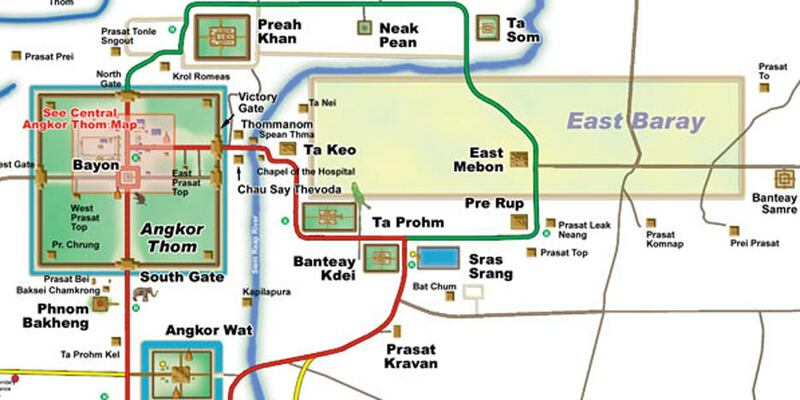 We took a bus from Ho Chi Minh to Phnom Penh, then Phnom Penh to Siem Reap. 6-7usd per person. That’s cheap in comaprison with flight ticket. Besides, for flight, you have to go to the airport at least an hour or 2 hours for international flight, plus waiting time for luggage. Ho Chi Minh – Phnom Penh took us 7 hours. Phnom Penh – Siem Reap took us 5 hours. Happy Khmer New Year! Nobody in Phnom Penh! We used this company http://catmekongexpress.com/. We bought tickets and paid online, just needed to present at their office 15 mins before departure time. They do not provide pick-up service. The bus from Ho Chi Minh was pretty hot (the weather outside was very hot too). Both were clean and had air con. They provided snacks, 1 small bottle of water and 1 wet tissue. The guide can speak English well. In Phnom Penh, they have 2 stations – one in the Japanese area, one next to the river. Our bus going to Siem Reap was at the station next to the river. Do check with them or you can ask the hotel to call them to check for you. The bus station in Siem Reap is a bit far from the city center. You should get a tuk tuk right there to get into the city. We paid $5 since we didn’t know how far it is to go to our hostel. But we supposed it should be cheaper since it was not really far, just 10 mins. In both Phnom Penh and Siem Reap, we went around by tuk tuk. It costs 1-2usd for the distance about 1-2km for 2 people. We always had to pay at least $2 and it’s kinda expensive for just 1km but no tuk tuk drivers accepts $1 or $1.5 just because we had 2 people. In Siem Reap, since we stayed longer, at night we rent a bicycle to explore the city night life. $2 per day for 1 bicycle. If your hotel does not have bicycles for rent, it’s easy to find many stores along the streets offering bicycles. In Phnom Penh, we stayed near the Russian market (not really near, it was around 1km and took us $2 to get there by tuk tuk). In Siem Reap, we stayed along the river, around 1km away from the night market. Not bad. 1km is not bad for walking, but during daytime, the temperature was over 40 C, we prefered tuk tuk! Anyway both places are quiet. There are always many choices for you on Agoda, Booking.com, Airbnb, etc. Room rate is approximately $20-25 per night for 2 in a hostel. Be careful with very low room rate, they are often fan room, no air con. But air con is a MUST, at least for us. In both places, there were no 7eleven nearby, but no worries, those touristy towns have many convenient stores for us to buy anything we want just in walking distance. For me, Cambodian cuisine is good, but not really special. $5-7 per meal per person in both cities. $2 a beer. Angkor beer is better than Cambodia beer. I like their salad, curry and fried rice with pineapple. $1 a smoothie in Siem Reap, very delish. Bubble tea (or milk tea with pearl, boba tea) is popular in Phnom Penh, but no bubble tea in Siem Reap. In case you want to try it, try KOI cafe in Phnom Penh since you cannot find it in Siem Reap. KOI is pretty good. I like their konjac milk tea and pearl milk tea. Phnom Penh, Brooklyn Pizza & Bistro (near Russian market) – they have super delicious pizza. A large size is perfect for 2. The link on Tripadvisor will give you a better look about Brooklyn Pizza. I wish I had time to try more. The restaurant is pretty busy at dinner time. You may want to book a table before you come. Phnom Penh, myBurgerLab Norodom (next to KOI cafe) – very good black burger. $2 for a mini. $3-5 for a normal size. Buy a bubble tea and bring it to the burger. Perfect! Siem Reap, Viva (in night market) – easy to find it since it’s big and red. Awesome Mexican food. The plate is big for ladies. $4-8 per dish. Great nachos, burrito, enchilada, and good magarita too. It’s crazy hot for sure. But if you plan to go to any temple, pagoda, royal palace, make sure to wear clothes that cover shoulders and knees at least or do bring a scarf (as I did at Royal Palace but going to the top of Angkor Wat scarf is unacceptable). An umbrella helps a lot too. Do wear your most comfort walking shoes/sandals since you’re going to walk a lot. 1 day – Killing field, Toul Sleng Genocide Museum, lunch, Royal Palace & Silver Pagoda. Those historical places are worth to visit. Half day – National Stadium, Central Market. Even though I was not in the shopping mood, but I wanted to see the Central Market, the real daily city life. Central Market is a real shopping place for local people I suppose. Since Phnom Penh has many branded stores but I didn’t see anyone there. We bought a 3 day Angkor ticket but we spent 2 days and rest the last day. Since after the 2nd day, we felt small temples are just similar and not special. To get to the temple area which is 10km from the city center, you need to book a tuk tuk for whole day (from $15 for the small red round and $18 for the big green round, including the price for sunrise or sunset). Since tuk tuk is not allowed to go inside the temple area unless tuk tuk has guests. As my tuk tuk told me (not sure if it was correct), it is a one way street from left to right. 1st day – sunrise at Angkor Wat, Angkor Thom. To catch the sunrise, we had to leave at 4:30am to the museum to buy the ticket then go to Angkor Wat. It was a pain to wake up at 4am, but it was totally worth it. Angkor Wat is not big on the map comparing with Angkor Thom, but it’s still pretty big walk just straightly from the front to the back. Walking way to the back gate, you will go through the long path that has big trees alongside, then there is a ruined gate and wall, pass it, there is a lake on the left. If you don’t want to wake up early, you can enjoy the sunset at Angkor Wat. I did it 4 years ago, it was really nice but it was much more crowded. Since it’s easier to go for sunset than sunrise. Angkor Thom is really huge and Bayon is the biggest one inside Angkor Thom. If there are some people who follow you and explain/introduce about the temples (they are not the guides) then 100% they ask for money at the end. We finished both at almost 1pm and were exhausted by the heat. Ta Prohm is so amazing. For me, Angkor Wat, Bayon (Angkor Thom) and Ta Prohm are all you need to see if you don’t have much time and can be done in one day. Since Ta Prohm is such an awesome place for tourists, if possible, you should wake up a bit early and get here early to avoid tourist groups (always has some groups that ruin your photo). Ta Prohm is famous with many big trees, and is well known as a location to film the Hollywood movie Tomb Raider. Can you spot the smiling face of an apsara between the tree roots? We were suggested to go to Phnom Bakheng on 3rd day for the sunset. The temple is in French style, different from others we saw. You may want to consider if you have time. Night market and the Pub Street – There are many many bars, pubs, restaurants, desserts, 7eleven and convenient stores, pharmacies, etc. Everything you want and need there. And you can wear whatever you want! shoes: 1 slippers, 1 walking/running shoes, 1 trekking shoes (because we planned to have some hiking and trekking, mine is actually a city trail running shoes). If you don’t plan to hike/trek, you may want a good walking sandals instead. April is the hottest month in a year in both Cambodia and Thailand. In Cambodia, the temp was around 37-39 C. In Thailand, the temp in Bangkok and Chiang Mai was around 41 C daytime. The temp in Krabi was as in Cambodia. Even though we were prepared ourselves mentally for the heat but we were very tired after half day staying outside. Do keep yourself hydrated by drinking alot of water and electrolytes. If you dont want to check in your bag, dont bring the Swiss knife. I brought my mini Swiss knife which has a mini knife, so I had to check in my big backpack. I didn’t use the cover for my backpack. After the Siem Reap – Bangkok flight, there was a really heavy rain (but it was quick) right before the flight took off, and when I got my checkin backpack in Bangkok, it was totally wet. My clothes inside were wet too. Lesson learnt. I ended up with 3 bags: 1 checkin and 2 carry-on including my fins bag. I always washed my underwears and bras myself. Most of the time if I could, I also washed my shirts, especially sport clothings myself because they are fast-dry. Laundry in Cambodia and Thailand is cheap, 1kg 1usd. Sometimes there are washing machines nearby to use by coins. Very convenient. 7eleven is everywhere and has everything I need. 7eleven and Family mart are always in walking distance. Pros: cheaper than buying individual flight tickets (remember to buy in MYR, it’s cheaper than buying in USD). The fare and fee is very cheap (4-5USD for domestic flight and about 30USD for international flight). Cons: have to redeem the flight at least 14 days prior the flight, seats for AAP are limited on each flight. It was a bit annoying that I could not redeem my flight from Chiang Mai to Krabi. But I could redeem the flights Chiang Mai – Bangkok and Bangkok – Krabi. It took more time and effort due to all the checkout and checkin processes. However, if you want to travel without plan, the Asean Pass may not be for you. Since it requests you basically plan your trip and book the flight at least 2 weeks before departure date. It’s kind of annoying when we all want to stay in one place as long as we want then decide where we should head to later. But I guess C’est la vie, we cannot have everything. It’s already too long now. I will continue about my trip in another post. Anyway that’s how I prepared for my trip and it worked for me. I hope it helps for your preparation somehow.